KoopaTV: Ace Attorney 6 Coming to the West! Is it just me, or does he look really serious? ...Guy's gotta remember to bring levity with him! The premise of the game, according to reports of this week's Famitsu, is that Mr. Wright is traveling to a non-Japanese (or non-Californian for localised folks) country that is still filled with a bunch of weirdos concerned about the spirits of dead people. So it's basically a giant haunted house, and it may incorporate horror elements. "The image shows how the upper-screen has images and and [SIC] keywords on the water, and the lower-screen shows parts of the testimony and a presenting option." She even has a Magatama-like thing. ...Is that an Indian dot? It's unclear how plucky this girl will be, but those are some nice leggings. Will Apollo Justice ever learn who his sister is? Did Phoenix Wright flee the country just to avoid telling him? 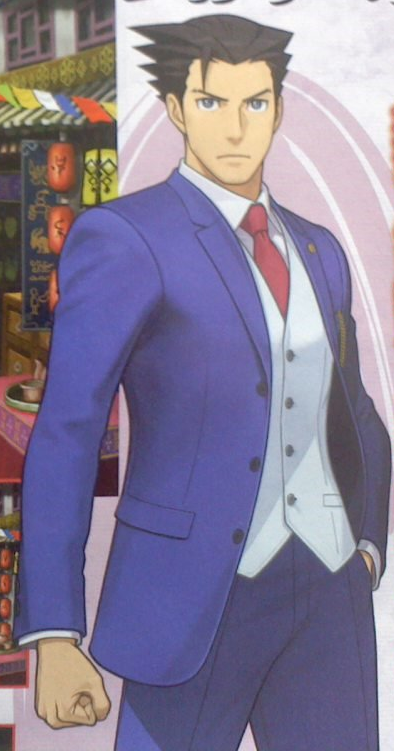 Since it's clearly a sequel to Dual Destinies, how many plotlines will they tie up that were never resolved in Apollo's game or Dual Destinies? And... since this game was immediately announced to be localised, does that mean the lack of transparency and clarity with regards to the localisations for Ace Attorney Investigations 2 and Dai Gyakuten Saiban mean those ain't gonna come over? 'cause if the Capcom standard is "we're actually planning to localise this game so we're going to tell you that information right away", then the unlocalised games in the Ace Attorney series CLEARLY don't meet that standard. It wouldn't be an article about Capcom without some begging involved: Please give us the game in a physical format! .........Yeah, I have just about zero faith that'll actually happen. So the game will be PLAYABLE at the Tokyo Game Show (September 17-19). We'll try to send well-regarded KoopaTV staffer and world-traveler Kamek over there, but our current ad revenue can't afford a plane ticket to Japan (or anything else). So please buy something from our overpriced merchandise store so we can give you exclusive coverage in Tokyo! The filler newsletter article of the month can wait for this important news — Ace Attorney is a large inspiration for the site's attitude, after all. That said, Round 4 of the KoopaTV Loyalty Rewards Program has started, but Ludwig will give you the details tomorrow. Or you can look at the informational page right now. September 17-19 has come, and so has the treasure of Ace Attorney information. A year after this, Ace Attorney 6 will be out in the West. It's also called Phoenix Wright: Ace Attorney — Spirit of Justice. Also, that Maya-like “girl” above is really a boy named Ahlbi Ur'gaid, but Ludwig refuses to acknowledge that. Spirit of Justice is coming out September 8, 2016! You can play the demo for the game! Ever since the bad sale figures of the first Investigations, it seems Capcom is afraid of bringing over any more spinoffs. *whispers* That kid with the Magatama is a boy. Ever since Larsa from Final Fantasy XII, I am ready for anything. "He is the fourth son"
...Okay. >_>; (Literally wearing a blouse.) Larsa is a pretty feminine name! ......Still, nowhere near the worst I've seen. Yeah, Mithos is lookin' a bit out of control. I've seen other folks on NSider react to his existence. Don't say that name so loud! I think people know Mithos exists. I'd be afraid to read the comments of Ace Attorney articles regardless of what I'd be playing because Ace Attorney fans are unpredictable crazy people. I try not to spoil stuff in games even if they're old. Hm, better avoid talking about videogames on the site then. I think it's only fair to avoid talking about spoilers to a game other than the one the article is about. Hey, I like to make a lot of comparisons when talking about games. I'm currently playing through the Ace Attorney Trilogy. I was first really introduced to the Phoenix Wright series through the crossover game with Professor Layton. Ever since I finished it, I knew I had to delve into the series. I do not regret my decision. Ace Attorney is the only videogame series besides Super Smash Bros. that I've bought every game that's in the series. ...Unless the game isn't available in the United States. Same here. Ace Attorney is one of reasons why I bought my original DS and now I own every copy. I already had my DS, since, y'know, I wouldn't buy a DS to play a series I knew nothing about.